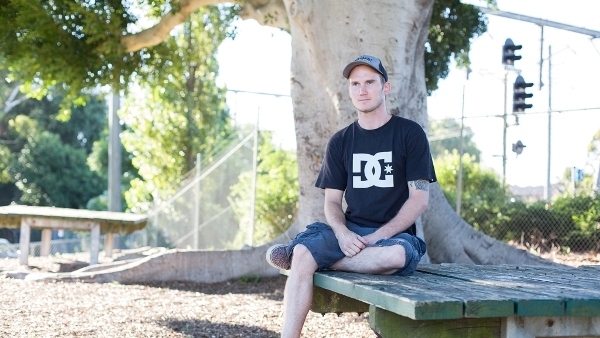 Now living in a cruisy bachelor pad in Parramatta, Joshua is a country boy at heart. To him, freedom is the simplicity of nature, and the ability to challenge suppression of the heart and mind. As a man who overcame drug addiction, alcoholism, and destitution, Joshua measures success on one’s ability to learn from their failures. My full name is Joshua Kane Paterson Taylor. I was born in Westmead, 1987. That’s a tricky one. I moved a lot as a child but I’ll rewind back to Granville. It was a good home, I guess. Yeah, it was good. So a good, comfortable home. Yeah, I guess so… It had a roof and walls and it was great. And that’s where you spent most of your childhood? No. Okay… when I was eight, we moved to Guilford. Then, after being in Guildford got three months, we moved to north NSW, to a small, country town [named] Tabulum. But the owners of the place we bought decided that actually didn’t want to sell, so we had to live in caravan parks for a bit. So yeah, we lived in caravan parks until we got a new place in a small town called Old Bonalbo. It was really cool. What’s that close to, Old Bonalbo? Old Bonalbo – that’s near Lismore. Lismore is the easiest for me to tell you. Describe a sensory memory from your childhood (favourite meal, most memorable smell as a child)? So, [whilst] living in Granville, [there was] a Lebanese Family across the road. I can still remember the smell of vine leaves and hummus when I used to go over to their place. I used to love that. I live in Parramatta, in an apartment. It’s cruisy – bachelor pad. Spacey. Nah… No, it does not. It does not feel like home at all. What about it doesn’t feel so much like home? Home, to me, even though I grew up in the city until I was eight [before] I moved to the country… I suppose home, to me, is nature [and] bush. Just being surrounded by peace and serenity, I guess. Being here, in the city, it’s very fast paced; a lot of things happening all at once. It’s very different. But, for me, where I was growing up, sure, the bush could be hostile, but there were also times when you could hide. There was [always] a place to hide. But here, even though I don’t find it to be as hostile, there is nowhere to hide. There’s always someone around. And to me, that raises my anxiety a bit high – I don’t have quiet time. When I was really young I wanted to be a Paleontologist. [I] love dinosaurs and I really, really, really wanted to be a Paleontologist – first big word I could pronounce. But now, as I’ve gotten older, I basically just want to be my own self; my own man. Basically, start my own business, or just be an entrepreneur in my own way. So that could be with HipHop, or could be with the music business, or could even [be starting] my own warehouse. Something. Anything. Just work for myself. What does Hip Hop mean to you man? Hip-hop, to me, means life. Hip-hop is life to me ‘cause, like, you know, R.A.P. means rhythm and poetry. So, when I first really got into hip-hop and rap, it actually really spoke to me, you know? Living in the household I lived in, everyone [else was a] metalhead – I couldn’t understand the screaming. But as soon as I listened to rap, something spoke to me. It was clever, and I think the cleverness of it is what actually drew me to it. The knowledge, wordplay, punchlines. You’ll hear something and you’re just like “woah! All he said was that he was gonna call up a girl, but the way he said it… like… woah, that was really cleverly said, you know?” Something like that. Strength, to me, means… You don’t measure a man by his success. You measure him by how he deals with failure to become successful again. That’s strength to me. A couple of years ago I moved to Caboolture and, in that time, I was living for a year without a job. I got addicted to anti-depressants. My girlfriend, at the time, was seeing a lot of other men. I had no money – nothing. I remember, one day, I was actually fighting with my dog for a piece of pizza – it got to that point. I was not sleeping – nothing. I really hated myself. All my teeth were really rotten; I was about 40 kilograms and I was addicted to a lot of things. So, for me to come down here to Sydney and fully change myself, I think that was extremely difficult for me. Where I am now, seeing where I came from – that one whole year of pressure – yeah, I think that really changed me, as a man. So, I think that’s probably one of the most difficult things. I’ve had other difficulties. I almost lost my left arm in a machine accident when I was 18. That was really tough. After that, I battled alcoholism and anxiety. I couldn’t be in a tight space, or anything – I didn’t like the feeling of being trapped. And I became actually extremely violent ‘cause I didn’t know how to talk it out. That was a very tough thing, too. But, you don’t go through these [things] to become a weak person. I’m actually a [much] stronger man now because of these things, and I’m very grateful, actually, for these incidents that have actually happened. How did I do it? Funnily enough, I’ve written a song about it. It’s called ‘The Waiting Room’. Just always remind yourself that life is like imagination. If you imagine it to be bad, it’s going to be bad. But if you keep thinking positive, it really is. As corny as it sounds, it really works. So, you had no pulse? No. I had no pulse. I was not breathing – [not] anything. If you have one piece of advice for your younger or future self, what would that be? Freedom, to me, is no suppression and not answering to anybody. So, like, no suppression could be anything – no money, nothing. Freedom. Could you elaborate on that a bit? Yeah, sure. What I mean by ‘no suppression’… If you go down the street and you look at a billboard that says “you’ve got a headache, take Panadol”, to me, that’s not freedom. That’s telling me to do something. Everywhere you look in this world, it’s telling [you] to do something. Subway – “eat fresh” – suddenly you ‘eat fresh’ Subway. To me, freedom doesn’t have any of those things. That’s why I like nature. You walk [around] and all you see are trees. You hear birds and smell the Earth. That’s freedom to me.